Learn about the different ways to find information in the developer portal. How do I search for information in the developer portal? What types of information are included in search results? How do I use special characters in search? How can I search in forums? 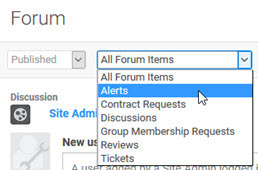 The developer portal includes multiple ways of finding the information you need, including information about APIs, Forum discussions, and Alerts. Use the Search feature in the top menu bar to search for any type of information. See How do I use the Search feature? Search through information in a specific forum, such as API, Discussion, or Ticket. See How can I search in forums? Use the Popular link in the top menu bar to select from a series of pre-configured searches for APIs and Apps including My APIs, All APIs, My Apps, and a variety of additional categories listed under Popular Searches. See below. You can select the Popular link to view a listing of pre-defined search filters for APIs and Apps, as shown below. My APIs Displays all public and private APIs that you have specific access to. All APIs Displays all public APIs, and all public and private APIs that you have specific access to. APIs: Last Updated Displays all available API content with most recently updated content at the top. APIs: Highest Rated Displays all available API content with highest rated content at the top, based on the number of times the API is marked (for example, 5-star rating). APIs: Most Used Displays all available API content based on the number of apps that are connected to the API. APIs: Most Popular Displays all available API content with most popular content at the top. Popularity is based on the average rating of Followers, API contracts, and Average Rating. My Apps Displays all public and private apps that you have specific access to. All Apps Displays all public apps, and all public and private apps that you have specific access to. Apps: Last Updated Displays all available app content with most recently updated content at the top. Apps: Highest Rated Displays all available app content with highest rated content at the top, based on the number of times the app is marked (for example, 5-star rating). Apps: Most Used Displays all available app content based on the number of APIs that the app is connected to. Apps: Most Popular Displays all available app content with most popular content at the top. Popularity is based on the average rating of Followers, Apps Connected, and Average Rating. You can choose a functional area for your search, as shown below. The platform searches through information associated with APIs, apps, groups, and users. Groups Group Name, Description, Tag. Documentation Any site content pages, such as help pages or homepage. Select the Search menu by clicking the magnifying glass icon that displays to the right of the top navigation. Specify search criteria in the Search text box. From the top menu bar, use the Search box at the top right to search for any content on the platform, as shown below. Enter your search criteria into the text box and then click the magnifying glass. The search results are displayed. When you have your search results, you can also use the additional options to refine your search, as shown below. Search: If needed, modify the search term in the Search box. Otherwise, it defaults to the initial search term you entered. If you're searching for something that has special characters in it, you might not get the expected results. A search for text containing special characters has to be written in a special way. If any reserved characters are included in search terms, they'll need to be escaped, or the search feature will not work as expected. Escaping the character means that you include a backslash (\) immediately before it. For example, to search for (123)app, you'd have to search for the following: \(123\)app. If you're naming platform resources such as apps and APIs, it's best to steer clear of special characters. If you're searching for resources that include these characters, escape them as above and you'll get the expected results. My Forum: available to all logged-in users. Includes forum entries for all APIs, apps, and groups that the specific user is associated with. App Forum: for public apps, or apps the logged-in user is associated with. API Forum: for public APIs, or APIs the logged-in user is associated with. Group Forum for public groups, or groups the logged-in user is associated with. The example below shows how search works on the Forum page for an individual. 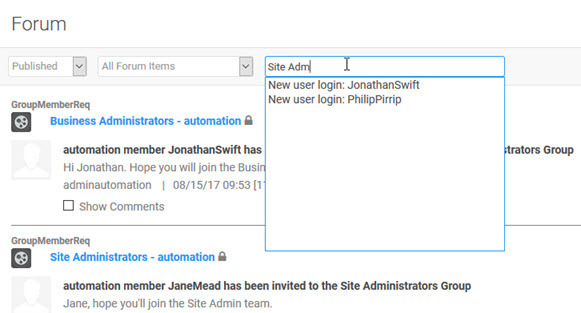 In this example, the user types in a few characters of a search term and the developer portal offers matching results. The user can then choose from the drop-down results list. The platform searches through information associated with APIs, apps, groups, and users. Search by Published or Unpublished items. Enter search wording; the UI presents matching results in a list that the user can then choose from. The example below shows how search works on the Forum page for an app. In this example, the user is searching by tags. The user types in the first few letters of the word "offer" and there is one matching result, since there is one discussion that has "offer" set up as a tag. In this example, you can see the matching entry, even though the user didn't yet choose the result, because it happens to be at the top of the list. Search by Type: Discussions, Tickets, Alerts, Requests, or All. In the API drop-down list, choose an API the app is associated with, or All. Sort search results by Most Recent, Most Popular, or Most Marked. Specify version: This version, or All versions. The example below shows how search works on the Forum page for an API. In this example, the user is searching in Discussions, for a discussion with a tag of "version." The user types in the first few letters of the word "version" and there is one matching result, since there is one discussion that has "version" set up as a tag. In this example, you can see the matching entry, even though the user didn't yet choose the result, because it happens to be at the top of the list. In the Apps drop-down list, choose an app that the API is associated with, or All. The example below shows how search works on the Forum page for a group. 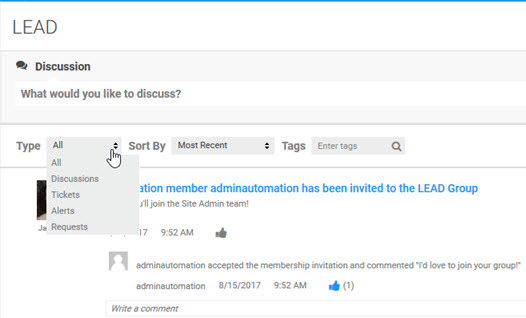 API board: How do I filter information in the API Forum? Dashboard: see How do I filter information on the Dashboard?